Looking to buy these with motor pods. Let me know what you have and how much. Thanks. Posted here because I am an old phart and can't figure out Banjo in the buy/sell. It's a shame SCX never sold these as spare, like they did with Audi and Xsara Pro chassis. Sure they would have sold a lot more than these two. Maybe they feared the standard cars would sell less if Pro Chassis were available ? Same for the Nascar Pro Wheels, they would have sell like "petit pains" as we say in France. I'm currently looking for these chassis' too. Scx never sold them as spares, neither plan to do it. And as SCX is (again) in a very bad situation, i don't think that kind of market is now interesting them. You just have to find some broken Pro cars to take apart the chassis, but it's a kind of impossible mission ! It's a good thing I have two new nascar pro kits that I bought months ago. The market is getting dried up as scx digital is becoming harder to find now. I also keep my two ones preciously, one runs (very fast !) quite often. The other is a shelf queen ! Not knowing exactly your situation I don't know if these would work for you or not. 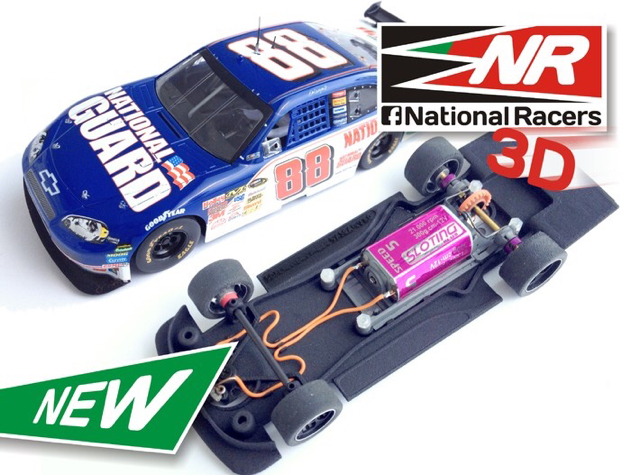 National Racer is making these 3D printed chassis offered through shapeways. They have the COT Chevy, Ford, and Toyota (which is what the PRO chassis would fit) as well as the older COY or "aero" Chevy, Dodge, and Ford. These will take a slot.it motor pod, inline, sidewinder, or angelwinder. I haven't ordered any yet to try them out, but they do look very promising. All of the other 3D printed chassis I've used have been great. Wow ! Great news !! Thanks for the information. Wouldn't fit into our class rules but they are neat. Basically you end up with a podded slotit NASCAR. Maybe so but it's not stock....therein lies the problem. Where can I get one the chassis from national racers? They are available through Shapeways.